Is there an increased risk of illness? With so many risky breakouts and recalls on foods in the past year, it’s no wonder that many people are shying away from items like romaine lettuce, ground beef and other foods for fear of getting sick with E. coli and other illnesses. But with the current government situation, including hundreds of thousands of federal employees not working, many fear the effects of decreased FDA and USDA inspections. 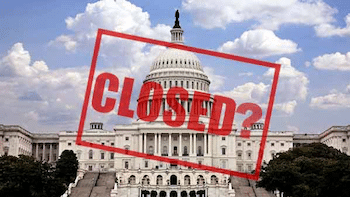 Is there an increased risk of illness because of the shutdown? Many people associate the safety of certain foods and drugs with the approval of the FDA (Food and Drug Administration) and the USDA (United States Department of Agriculture). In fact, when something is labeled FDA approved or USDA inspected, it’s considered safe to consume, whether it’s a supplement, medicine or a food item. So the question is when a government shutdown occurs and FDA and USDA workers are no longer inspecting certain items—is there an increased risk of illness when consuming them? The answer is—maybe. Since the shutdown, the USDA, which regulates the nation’s meat and poultry slaughterhouses reported that 90% of their workforce was still on the job. Inspections of poultry and eggs were not interrupted. The FDA, which halted inspections on many foods, including produce, dairy products and items like breakfast cereal, on December 22, 2018, has resumed inspections as of January 15, 2019. Many items during that time period were not inspected and could be risky to consume. Although the news can be overwhelming at times, it’s a good idea to keep up with the latest developments when it comes to food and medicine inspections. In addition, it’s suggested that pregnant women and anyone with a compromised immune system stay away from items that are not being inspected, as well as be vigilant about checking labels and washing produce. For more information about health-related topics and medical waste management and disposal, check our blog often. It is our goal to offer you valuable resources to assist you in protecting your health and well-being. All Points Medical Waste provides full-service medical waste disposal to doctor’s offices, clinics, veterinarians, treatment facilities, schools, tattoo parlors, dental offices, nursing homes, and many other facilities. Give us a call today or fill out a quote request to find out how we can serve you. Dawn is the vice president of All Points Medical Waste. All Points Medical Waste is a family-owned and operated medical waste disposal and compliance company that has been serving the Treasure Coast, Palm Beaches, and surrounding areas since 1994.